Navajos in a U.S. Marine artillery regiment relay orders over a field radio in their native tongue. In early 1942, World War II was not going well for the Allies. France had fallen. Britain was still staggering from the Blitz. Japanese forces had crippled the U.S. Pacific Fleet at Pearl Harbor, attacked the Philippines and Guam, and were seizing territory in the south and central Pacific in assaults that included sinking British battleship Prince of Wales and battle cruiser Repulse off Malaya. Germany armies had advance deep into the Soviet Union. Hitler’s submarines were wreaking havoc on convoys leaving the United States for Russian ports. In wartime, secure communications are crucial, but for the U.S. armed forces, securing messages become a bewildering problem. Japanese cryptographers, many of them educated in the United States and fluent in standard and colloquial English, were amazingly adept at breaking codes. Enemy forces often knew about American battle plans in advance, and no defense against Japanese codebreaking had materialized. “Military communications were made available to the enemy like sand sifting through a sieve,” an analyst said. An unlikely answer came from an unlikely source. Philip Johnston, a civil engineer who lived in Los Angeles, was the child of missionaries who had raised their son on the Navajo Reservation, which stretches across New Mexico and Arizona. Born in Kansas in 1892, Johnson had grown up speaking Navajo. In that language, unique to reservation dwellers and rarely used elsewhere, inflection determines a word’s meaning. Depending on pronunciation, a Navajo word can have four distinct meanings. Navajo verb forms are especially complex. Outsiders generally find the language incomprehensible and have likened hearing it spoken to listening to the rumble of a freight train, the gurgling of a partially blocked drain, and the flushing of an old-fashioned commode. In 1942, there was no Navajo alphabet. The language did not exist in written form. At government boarding schools to which Indian children were sent, teachers and administrators often forbade their charges to speak Navajo or any other Indian language, demanding that they speak only English. At 50, Johnson, who had served in France with the American Expeditionary Force during World War I, was too old to fight in World War II, but he still wanted to serve. Reading an article about military security, he had an idea: base a secret code on Navajo. He thought through his concept and in February 1942 visited U.S. Marine Corps Camp Elliott near San Diego. At a meeting with Signal Corp Communications Officer Lieutenant Colonel James E. Jones, Johnston described how a code based on Navajo would thwart enemy codebreakers. Jones was skeptical but Johnston persuaded him to test the premise. Back in Los Angeles, Johnston recruited four bilingual Navajos. He and they traveled on February 28 to Camp Elliott for a demonstration before Marine staff officers. Two Navajos were given a typical military field order and assigned to a room from which they were to transmit the message in Navajo to their companions several rooms away. Retranslated into English, the Navajo message accurately recapitulated the order as given, amazing the Marine observers. Impressed, Camp Elliott commander Major General Clayton Vogel asked Marine Corps Headquarters in Washington, DC, to authorize the immediate recruitment of 200 young, well-educated Navajos as Marine communications specialists. Headquarters authorized 30, reasoning that to be enough to prove Johnston’s theory. The Navajos were assigned to devise a code in their language that would baffle enemy listeners. Code words had to be short and easily learned and recalled. The men developed a two-part code. A 26-letter phonetic alphabet used Navajo names for 18 animals or birds, plus the words “ice” (the letter I), “nut” (N), “quiver” (Q), “Ute” (U), “victor” (V), “cross” (X), “yucca” (Y), and “zinc” (Z). The second part was a 211-word English vocabulary with Navajo synonyms. Conventional Marine Corps codes involved lengthy encoding and deciphering procedures using sophisticated electronic equipment. The Navajo code, relying on the sender’s and the receiver’s brains, mouths, and ears, was much faster. 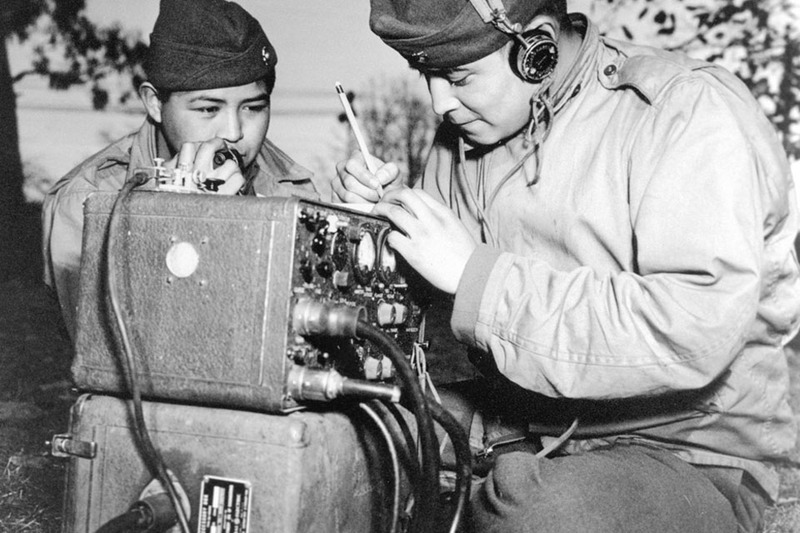 In training and in combat, code-talkers’ proficiency erased official distrust. One volunteer dropped out. Several remained in California to train the next group. Two became recruiters. The rest reported to Guadalcanal in August 1942, assigned to the First Marine Division, commanded by Major General Alexander Vandegrift, who soon was asking headquarters for 83 more Navajo just to handle encoding and decoding for his division. A second group of volunteers went through boot camp, then was assigned to the code-talker program at Camp Pendleton, which by August 1943 had trained nearly 200 Navajo and whose administrator was Staff Sergeant Philip Johnston. In jungle combat, stamina, Spartan habits, ingenuity, scouting and tracking skill, and utter disregard for hardship stood the Navajo in good stead. 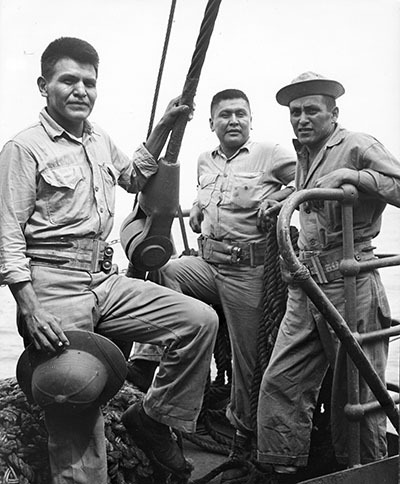 At first assigned mainly at the company-battalion level, code-talkers became virtually indispensable. Often, especially when a Marine regiment was fighting alongside an Army unit, white soldiers mistook the Navajo for the enemy, nearly costing several code-talkers their lives. Sometimes GIs “captured” and interrogated Navajo. 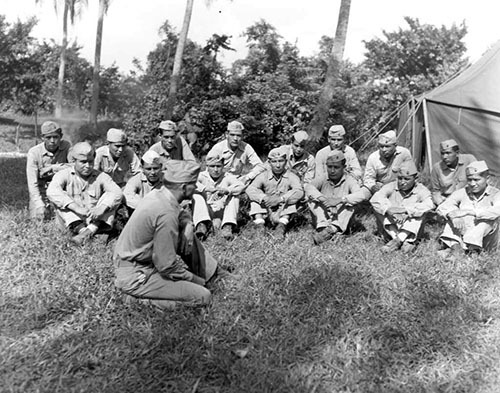 Code-talker William McCabe, waiting on a Guadalcanal beach for his ship, joined a chow line. “I got lost among the big chow dump,” he recalled, “All of a sudden I heard somebody say, ‘Halt,’ and I kept walking. ‘Hey, you! Halt, or I’m gonna shoot!’. . . . [T]here was a big rifle all cocked and ready to shoot. I’m just from my outfit, I was coming here to get something to eat. And he said, ‘I think you’re a Jap. Just come with me.’” After that incident, a white fellow Marine accompanied McCabe at all times. “Navajo School” graduated 421 code talkers assigned mostly to combat units overseas. Following Japan’s surrender, several volunteered for occupation duty. Others were sent to Marine units in China. Code talker Willson Price stayed a Marine for 30 years, retiring in 1972. Most code talkers came home to family reunions and purification rites, traditional dances, and curing ceremonies, coupled with maternal prayers of thanks for sons’ safe return. These rites originated to protect returning Navajo from harmful influences they might have encountered or duties they had to to perform while away. In June 1969, the Fourth Marine Division honored its Navajo members at the unit’s annual reunion in Chicago, presenting 20 former code-talkers with medallions honoring each man’s wartime exploits. A few veteran code talkers still take part in holiday parades, often riding in convertibles. The Navajo Nation has chosen several to serve as chairman and vice-chairman, the tribe’s top executive positions, and others have served on the Tribal Council. The Navajo Code Talkers’ Association meets regularly at Window Rock, Arizona, the Navajo Nation capital. Click here to read an interview with Code Talker Chester Nez. This story was originally published in the February 1997 issue of American History magazine. For more great articles, subscribe here.